They were found crammed together in a 4x4 stall, standing in nearly 3 feet of manure. Their manes and tails were matted with feces, urine and burrs. Their grossly overgrown hooves and deformed legs suggested that they had been living in squalor for not months, but years. On Sunday, four miniature horses (three mares and one stud of unknown age) were taken from a home in Indiana by the Horse Shoe Equine Rescue, a rescue lead by owners Ron and Tammy Barnett, along with two volunteers. In their small stall, the horses were without food bowls and buckets, said Susi Shelton, a staffer at the rescue. Most shocking of all were the extreme deformities of the horses' tendons and hooves, leaving them crippled. "They couldn't run from us if they tried, because of their hooves," Shelton said. "Their tendons are all stretched in different directions now, and they're going to have to re-learn to walk," Ron told local news outlet WTHITV. "It's going to take a while before they can actually get back to the point where they can walk straight again or even run again," he said. 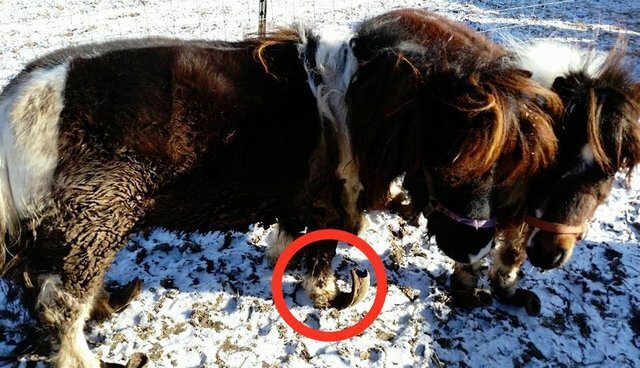 "We're not talking 6 months of neglect, we're talking years of neglect," Susan Ogier, a farrier (person who trims and shoes horses' hooves), told WTHITV. On Monday, Ogier worked to remove the growths from the horses' hooves. "It's not going to be as functional as it needs to be, but they are going to be so much more comfortable than they are right now," Ogier said. Tammy told The Dodo that despite all that the horses have been through, they've all been sweet and very well-behaved. "They will need many more months of hoof care," Tammy said. "They just need time to heal and learn trust." If you'd like to donate to support the horses at the Horse Shoe Equine Rescue, click here.